Yes, actual cooking times are longer. But preparation is much easier. Many models come with a timer, so you can do your preparation in advance. For example, before work in the morning, and setup the timer so that it gets done in time for dinner. 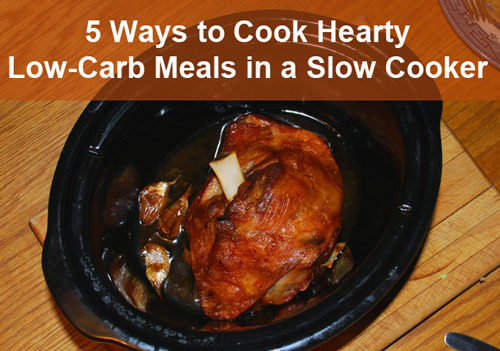 Here’s why I think a slow-cooker is really useful for low-carb food. Slow cooker can turn any combination of meat and vegetables into gorgeous hearty meals. For most recipes, it is enough just to chop up all ingredients and stick them in at the same time, to end up with a delicious meal several hours later. If you have the time, quickly brown meat and vegetables in a frying pan before putting into slow-cooker, but this is optional. Add some ethnic motifs with herbs and spices. Just use your imagination and experiment – I often throw together whatever meat and veg I happen to have in the fridge and it always turns out well. Recipe example: brown cubed lamb shoulder, add some chopped onion, chopped aubergine and a tin of tomatoes, add black pepper and coriander, cook on High for 3-4 hours. Fresh meat can be expensive. Slow cooking transforms cheaper joints, such as beef brisket, lamb shanks or pork belly. Recipe example: Get two lamb shanks, add shallots, garlic and herbs (rosemary, thyme, sage, bay leaves) and cook on High for 4-8 hours (depending on the size of the joint) for the meat to become tender and melting. 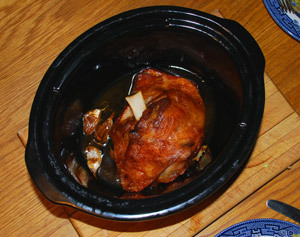 Slow cooking poultry works great for dark meat. Whole chicken, duck legs or breasts and turkey drumsticks come out great. If you are cooking leaner meat such as chicken or turkey breasts, add some fat for best results – for example, cream or strips of bacon. Recipe example: For a rotisserie-style chicken, stick a whole bird into the slow-cooker for 2-3 hours on High, and then crisp the skin in the oven for 30 minutes or so before serving. Shop-bought stocks (or even worse, stock cubes) can be high in carbs, not to mention preservatives and other chemicals. Avoid this pitfall by making your own stock – really easy in a slow-cooker. I save chicken and meat bones after meals (stick them in the freezer if not making stock right away), and make my own stock, which can also be frozen until needed. It is much simpler than it sounds. Recipe example: Just fill up the pot with water, add the bones (really any sort) and some salt. If you happen to have some, add some peppercorns and herbs such as bay leaves or bouquet garni. Then just put it on High for 8-12 hours – I tend to leave mine on overnight. Get the bones out and refrigerate or freeze your stock, or make soup by adding some vegetables and cooking for a bit further. Making eggs in a slow-cooker turns them light and fluffy. Prepare it in the evening and leave on overnight to wake up to a lovely breakfast. Recipe example: Beat 6 eggs with ½ cup of milk, 1 cup of vegetables and 1 cup of ham/cheese, mix together and cook on Low for 8 hours or 3 hours on High.